Louison was the first to win the Tour de France three years in succession (1953 – 1955), and this will always be considered his greatest cycling achievement. 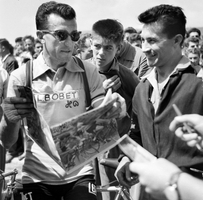 But Bobet was also something of a rouleur, able to win several one day races and classics. Milan-San Remo of course, but also Roubaix, Flanders, and the Road World Championship in 1954. In 1959 Bobet even managed victory in the now defunct Paris-Bordeaux race. 350 miles in one run. It was an effort that could ruin the rest of your season. Yes, for about half of the race you were drafted by a derny, but that doesn’t diminish the effort. 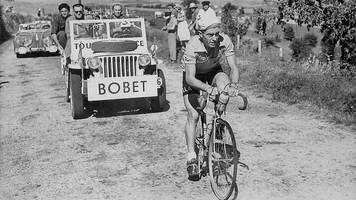 Being led or not, Bobet was on his bike for 15 hours 24 minutes and 4 seconds, pedaling as fast as he could. To win a race like that, you need to know suffering. You need to embrace it, and convince yourself that suffering is your natural state. And yet the man’s off bike persona was more of a dandy than a bike racer. The common perception was that Louison dressed above his station, and acted with an elegance that was un-relatable. Cycling fans wanted heroes that looked, acted and talked like them. But this was not Louison. 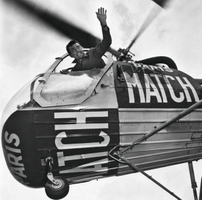 He flew planes while away from the bike, drove an Italian car, and was obsessive about personal hygiene. 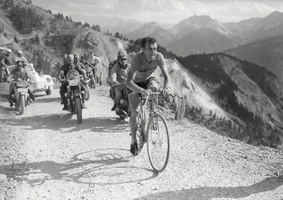 So much so, that when he first earned the yellow jersey in 1953, Louison refused to wear it. The jersey was made from synthetic fibers, and Bobet insisted instead on pure wool, forcing race organizers to craft one overnight. It’s ironic that in spite of his obsessive cleanliness, the man was plagued by saddle sores. After painfully struggling through his last Tour de France victory in 1955, Bobet required surgery for a horrible boil that had been plaguing him for much of the race. 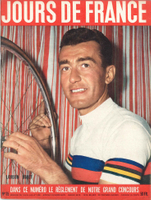 Reports say Louison’s body was riddled with “holes” by the end of that Tour, and while cancer was speculated, it was only whispered about quietly, in darkened rooms far from the earshot of Bobet. Cancer is what eventually conquered Louison, although it was many years later, in 1983. And you wonder just where the manic drive came from. His father? In Jean Bobet’s book, “Tomorrow we Ride,” Jean (also a professional cyclist) recalls a race he competed in with his brother, Louison. They duo had just been sidelined by a puncture, and the peloton had ridden away from them. “For three laps of the 15 kilometer circuit we put everything into the chase, but the gap kept growing. It was no use. Louison gave up, and I, of course, with him. There was nothing for it but to go back to the garage, the car, and home. We found the garage all right, but the car was not there. Nor, for that matter, was our father. Louison let fly a string of expletives which helped to bring me round, exhausted as I was from the effort we had kept up for over an hour. Louison’s upbringing is dotted with stories like this one, and it’s hard to think these “lessons” wouldn’t affect him, his work ethic or outlook on life. The complexities of the human condition, and the single mindedness of a champion. 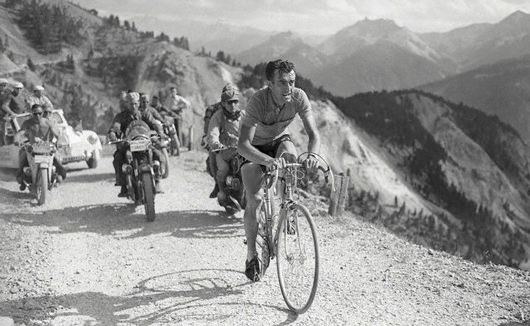 Louison Bobet, a true cycling hero.